What is the Simplex Sampler? The Micropure Simplex Sampler is an in-line product sampling device for liquids that allows you to monitor product purity at critical stages of the production process. The sterile, closed-system Simplex Sampler automatically draws specific amounts of liquid product samples at predetermined intervals and locations, providing early detection and isolation of potential contamination areas. Especially important in processing applications where bacterial and compositional control is critical, the Simplex Sampler saves time and money in system evaluation and product loss. Because the Simplex Sampler accurately locates potential contamination points in your system, you can isolate and treat affected areas quickly, resulting in considerably less downtime compared to an exhaustive inspection of your entire system. And because samples are drawn automatically at specific time intervals, early detection of problems means less product loss. 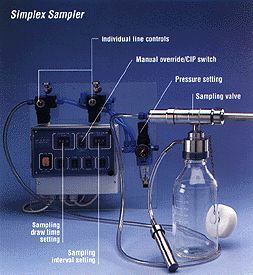 At preset intervals, a seated pneumatic valve attached to the process line opens, allowing liquid product to pass through the sampling probe into the sterile sampling bottle. The Steri-Cap lid prevents contamination of the sampling bottle but allows any overpressure in the bottle to be vented. The control panel regulates the frequency of the sampling as well as the volume of the sample to be taken. Samples can be drawn up to 10 times per minute, and you can select a draw time ranging from 0.1 to 99.0 seconds to regulate the sample volume desired. Samples can be drawn independently of the automatic program by activating a manual override switch on the control panel. Up to four sampling lines can be connected to a control panel to monitor four separate points in your process line. Complete sterility is ensured throughout the closed collection process, and a "lock-on" switch permits CIP solution to completely sanitize the Simplex Sampler system concurrently with the sanitization of your entire processing system. Sampling bottles can be sterilized for repeated use. Automated sampling of your product in consistent volumes and intervals simplifies testing procedures and provides assurance that your high quality standards are continually met during every stage of the process.